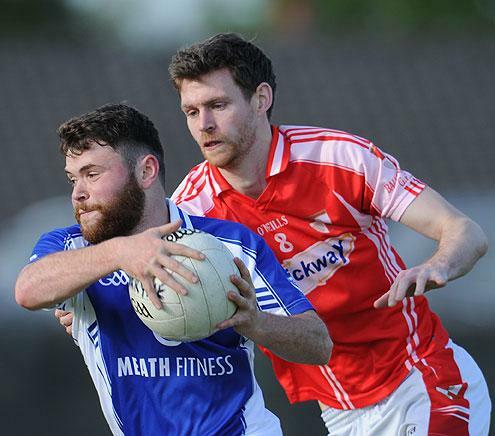 Skryne's Conor O'Brien seeks to escape the clutches of Ballinlough's Cian Mallen. The ‘Lough dominated the opening half, but were left to rue missed chances, as they let several good scoring opportunities go to waste. Wing back Adam O’Sullivan briefly restored Skryne’s lead with a fine effort off the outside of the boot, but just minutes later his side fell behind. Ballinlough captain Cian Mallen sent a great cross field ball into the area and Devine was on hand to flick it into the back of the net. Conor O’Brien and Paddy Fox got the Tara men back into it with good points from play, before Mark Battersby picked up his first score of the afternoon with a confidently struck free. Sean Geraghty got Ballinlough’s sole point in the second half, splitting the posts after a surging run from Cian Mallen in the middle of the field. A goal from Tommy McCullen in the closing stages turned out to be mere consolation for the North Meath men. Ballinlough: K. McGuinness, B. Smith, M. Geraghty, R. Farrell, P. Muldoon, L. Maguire, E. Smith, Cian Mallen, Colm Mallen, S. Geraghty (0-1), R. McGuinness, P. Byrne, T. McCullen (1-2), Johnny Reilly, K. Devine (1-1). Subs: Junior O’Reilly for R. McGuinness, J. Tunney for K. Devine, K. Beirne for E. Smith. Skryne: I. Gillette. N. Lenehan, C. Lenehan, V. O'Reilly. R. McCabe, M. Jordan, A. O'Sullivan (0-2). A. Tuite, D. Ryan. T. McKeown, C. O’Brien (0-1), P. Fox (0-1). J. Morley (0-1), B. Davis (0-3), M. Battersby (0-5). Subs. H. Rooney and S. O'Brien (0-1).